I know some of you are getting closer to back to school than I am, but I can still feel it! The holidays are getting shorter, the work becoming more frequent. I have seen so many gorgeous pictures of classrooms all decorated and ready to go. I am actually counting down the days until I can get into my new classroom and start organizing and decorating! If you haven't heard yet, Teachers pay Teachers is having a back to school sale! 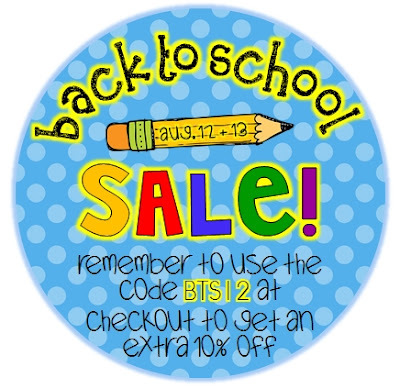 From August 12th to 13th, TpT is offering 10% off! I am so excited! My cart is stuffed right full of exciting new units I can't wait to use with my new kiddos. I also decided this would be perfect timing for my first ever linky party. So, if you are having a back to school sale at your Teachers pay Teachers store, please PLEASE link up here! Please link directly to your TpT store (not your blog). In the name spot, please write how much your sale is and your name/blog name. I can't wait to go shopping!! Please feel free to use the picture above to spread the word about this incredible sale! Hello! My name's Lisa and I just wanted to let you know you inspired my first linky party with this post! I borrowed your sale ad above for my blog page to help spread the word. I gave you credit and a link back to your blog of course! Come join my linky party and spread the word for your sale on my page too! I love that button!! Can I borrow it too?? I love your button, too! Very cute! Thanks for hosting. Your button is to die for!!! Awwww thanks! :) Feel free to use the button on your own blog! I am definitely joining this linky asap! Looking For Fern Smith's Classroom Ideas? Click Here! What an awesome idea...thanks BUNCHES!!!!! Amanda, the coupon code on the button should be BTS12, will you make a new button so I can still use yours?? Thanks for hosting this party. I'm a new follower and love your darling blog! Monday Made It... Just a Tad Late!